The #GoodwillDate concept originally went viral back in 2015 when two Florida couples decided to spice up their double date night by picking outfits from Goodwill for their partner to wear. With a $10 per person budget and a solid sense of humor, they each selected an entire ensemble for their date to wear out that memorable evening. Inspired by their story, I was curious to see how Ryan and I would do on a Goodwill date. Valentine’s Day seemed like the perfect opportunity! We upped the ante by increasing our spending budget to $15, so we could also include a couples’ activity to fill out our date night. Without a babysitter available, our son had to tag along, but that was actually good motivation for us to limit our browsing and focus on the task at hand: choosing an outfit for the other person to wear and an activity for us to share together that night. With a message-in-a-bottle love letter idea, I grabbed some bottles from the abundant glassware section and rolls of ribbon and lace from the wares area. 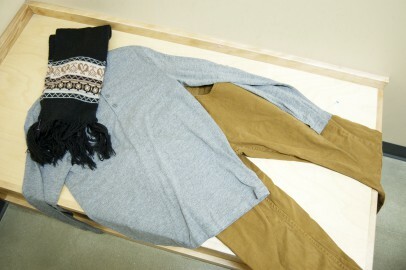 A long-sleeved Henley and some chinos jumped off the men’s rack at me for Ryan to wear, and I tied their colors together with a scarf (it is February, after all). My Valentine found a DVD that looked like our taste, and for just $2 it was much cheaper than going out to the movies. 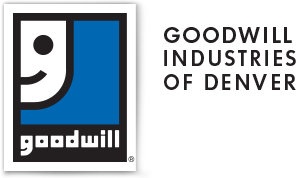 Plus, Goodwill organizations’ employment programs promote independence and dignity for people to provide for themselves and their families, so by spending money at Goodwill we’re also helping our community! I was pleasantly surprised at the look Ryan chose for me. My closet is entirely comprised of neutrals, stripes, and pops of yellow, mint, and blue so I’d say he nailed it. We took turns trying on our outfits just to make sure they fit while the other person chased our toddler around then headed back home! 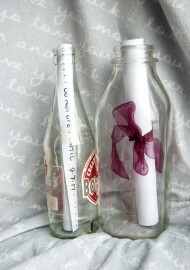 After getting our son down for the night, we started part two of our date: the messages in a bottle and movie night. Any sort of vase, jar, or bottle will do if you decide to write love notes with your valentine, so pick whatever glassware appeals to you most. Just remember that the narrower the hole in the top, the tinier you’ll have to roll up your message and you’ll need a little extra space for the ribbon, too. For our project, we used vintage glass bottle found at goodwill, paper & markers for the notes, ribbon, plus an elastic (which kept the paper rolled while we tied on ribbon) and scissors (for trimming the ribbon). Before settling in for the movie, we took some time to write each other a letter. I reflected on the last decade and what’s in store for our future, trying to share specific memories I loved, but wasn’t sure he’d remember. 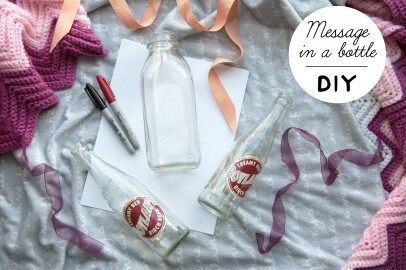 Not only is this a fun Valentine’s Day activity, but when we un-bottle our messages on our tenth anniversary (this September), they’ll be a very special gift! We wrote the date we plan to open our messages on the bottom edge of the back side of the letter, then rolled them up. For a super tight roll, wrap the paper around a pen then roll the pen down the page and slide it out of the roll when you’re done. 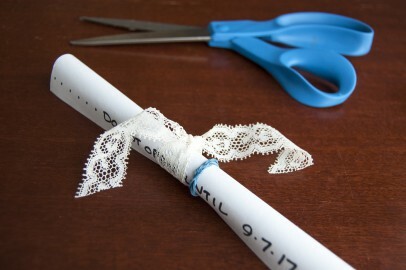 Use an elastic to keep the message rolled tightly while you tie on a ribbon, then remove the elastic and pop it in a jar! If we had picked a date any further out, I probably would have added our names to the visible paper edge just so we could be sure we were opening the right message. What are your Valentine’s Day plans? 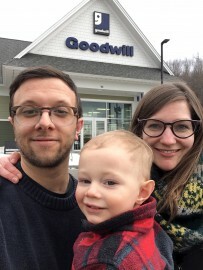 We had a great time on our #GoodwillDate and would absolutely recommend it to others! I loved the stress-free fun of trying to pick an outfit he’d love and of making new memories together. Maybe this day will be something we write about in a love letter another ten years down the road!